Desc: Pewter tile Thoroughbred necklace. The chain is large oval links alternating with small round links and is silver color and has a lobster claw clasp. The image in this pewter tile is a Thoroughbred running for the winner's circle. The Thoroughbred is a chestnut and the other horses are in shades of blue in the background. The pendant has a matte finish. 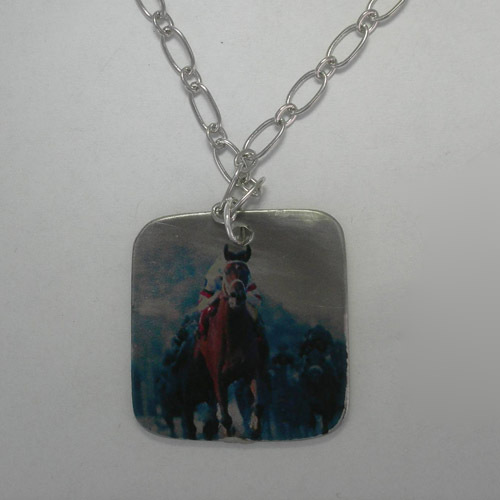 This pendant can be customized with your own picture of your horse or pet or family member or whatever your imagination can come up with. Contact us for details.